The regulation of gene expression plays a vital role in morphogenesis by controlling the cellular mechanisms of cell division and cell specialization. Moreover, cellular behavior such as cell migration, cellular properties such as cell adhesion as well as apoptosis are also controlled by the regulation of gene expression, promoting morphogenesis. Morphogenesis is the biological process through which an organism develops its shape. It is driven by various cellular and developmental processes such as cell division, cell specialization, apoptosis, cell migration, and cell adhesion. Since this process controls the special distribution of an organism, morphogenesis mainly occurs during embryonic development. The molecules responsible for morphogenesis are morphogens. They are secreted growth factors that induce several intracellular signaling pathways. The concentration gradient of morphogens determines the fate of the cell. The fate of the cell is determined through the interactions of morphogens with cellular DNA at different levels. Genetic blueprint or the genome of that particular organism and the environment are two factors involved in the determination of the morphogenesis of a particular entity. Morphogenesis is the process of embryonic development by which an organism, organ or a tissue develops its shape. It occurs through various cellular processes such as cell division, cell specialization, cell migration, cell adhesion, and apoptosis. It is involved in organizing the cells during adult stage as well. It also occurs in unicellular organisms. Morphogenesis in plants mainly occurs through differential growth. Generally, plants contain permanent morphogenetic tissues whose morphogenetic potential depends on the environment. Morphogenesis is induced through sending signaling molecules known as morphogens produced by specialized, adjacent cells to the generic cells. Morphogens are the molecules responsible for morphogenesis. They are water-soluble, growth factors that bring their effect through inducing signaling pathways. Some signaling pathways are planar cell polarity (PCP, notch signaling, wingless (WNT), sonic hedgehog (SHH), bone morphogenetic protein (BMP), retinoic acid (RA), and fibroblast growth factor (FGF) pathways. The concentration gradient of morphogens determines the fate of the cell. These signaling pathways ultimately activate transcription factors that alter the gene expression. 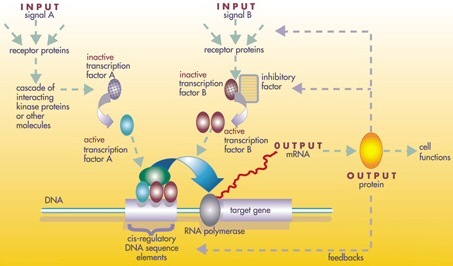 The regulation of the gene expression through cell signaling cascades is shown in figure 1. 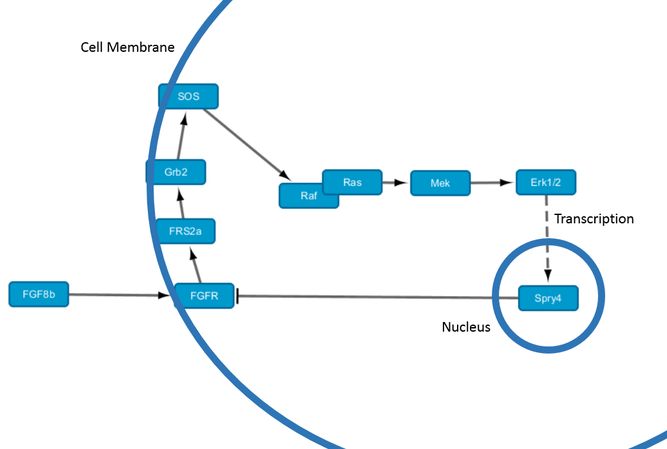 As an example, the FGF pathway stimulates signaling molecules such as ERK, which regulates the gene expression at both transcriptional and posttranslational levels. The FGF pathway is a type of intracellular receptor tyrosine kinase signaling pathway, which activates upon binding to growth factors, hormones, and cytokines. The regulation of gene expression through FGF pathway is shown in figure 2. Therefore, gene regulatory networks govern the gene expression, regulating the levels of mRNA and proteins in a cell through various types of molecular regulators interacting with each other. The regulation of gene expression plays a vital role in morphogenesis by controlling the cellular mechanisms of cell division and specialization. Moreover, cellular behavior such as cell migration, cellular properties such as cell adhesion as well as apoptosis are also controlled by the regulation of gene expression, promoting morphogenesis. 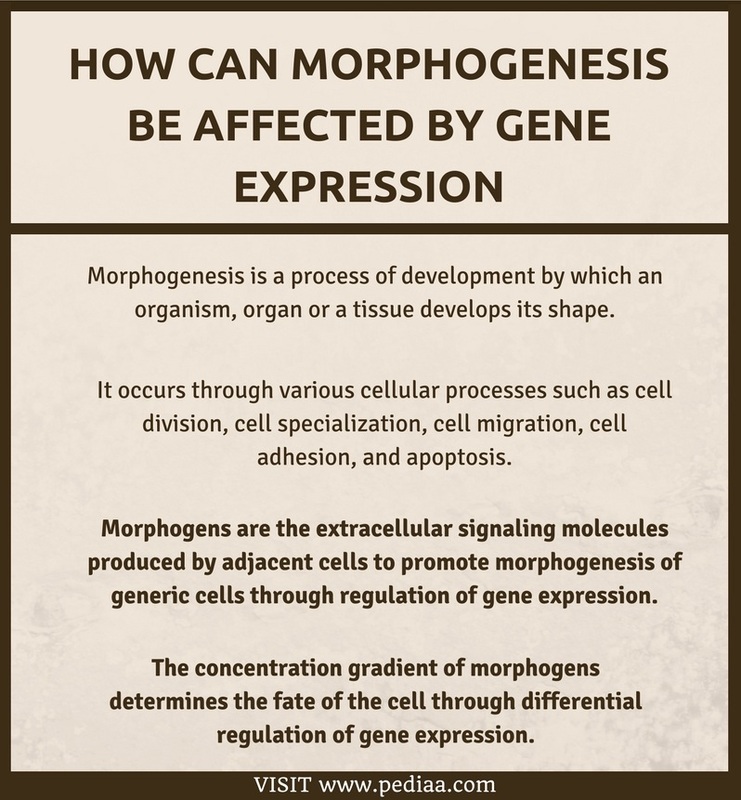 Hence, higher concentrations of morphogens cause high-level of gene expression regulation while lower concentrations of morphogens cause low-level of gene expression. Morphogenesis is the biological process through which the shape of an animal or a plant is determined. Morphogens are the extracellular signaling molecules produced by adjacent cells to promote morphogenesis of generic cells through regulation of gene expression during morphogenesis. 1. Basson, Albert. “Signaling in Cell Differentiation and Morphogenesis.” Cold Spring Harbor Perspectives in Biology, Available here.